Below is the short list of fabrics for this first round. I added the deeper yellow/oranges hoping it would add brightness and contrast. 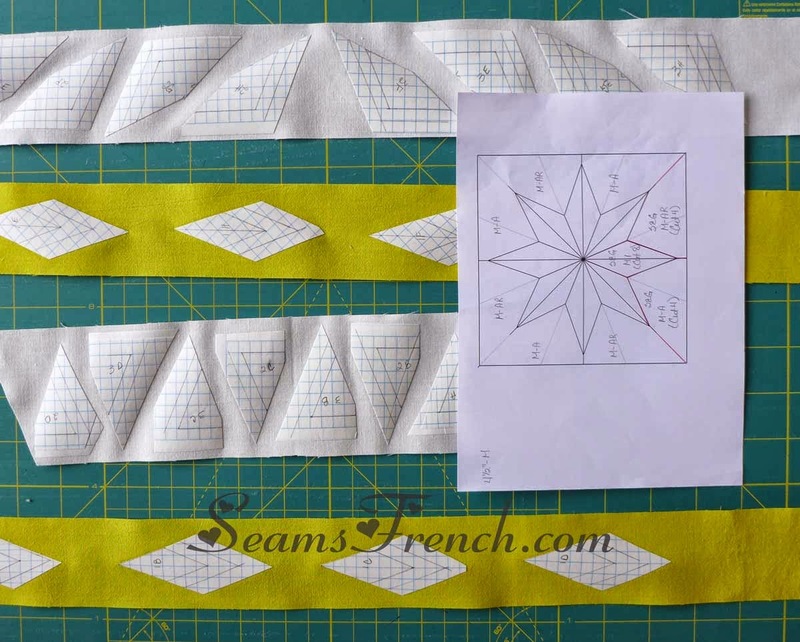 Before I actually started stitching the sections, remembering that Alex Anderson from "The Quilt Show" has done a number of teaching segments on star construction, I watched a few of these segments, made a few notes, and forged ahead to my machine. Alex uses a fairly traditional piecing technique, which involves accurate cutting, accurate piecing and careful pressing. (A common sense approach.) 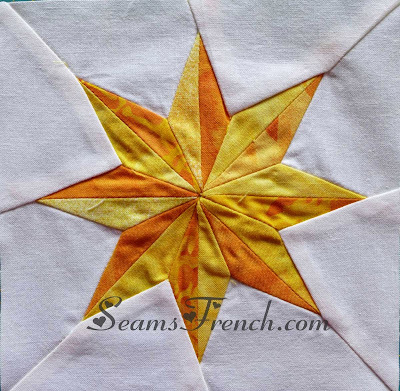 Other then choosing to press more of the seams open then Alex recommends, this first star attempts to follow her technique. It wasn't too bad for the first star, but it wasn't good enough. Even though I pressed the center seams open, there is too much bulk in the center, where the points meet. And the points don't meet very accurately. Hmmm...! This wasn't going to be quite as easy (or as fast) as I had fooled myself into believing. So, it was time to consult the experts. Out came other references:"Mastering Precision Piecing" by Sally Collins, "Piece by Piece, Machine Applique" by Sharon Schamber & Cristy Fincher, "Star Quilts" by Mary Knapp, Edyta Sitar You Tube videos, and countless other resource books and videos. All of the above mentioned, very talented quilters, are somehow perfectly capable constructing beautiful stars with perfect points and precisely matched centers using their specific technique. I was not that fortunate. After trying about 5 or 6 of these different techniques, my results were still disappointing. 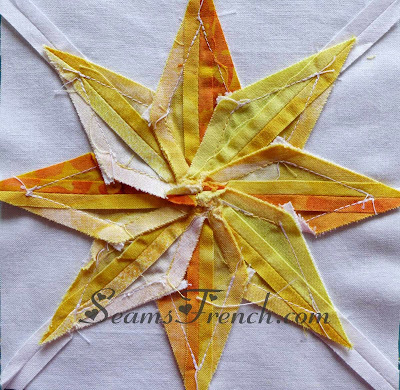 Regardless of how severely I trimmed the center meeting point, the split star points made the bulk in the center too thick to use in a baby quilt. 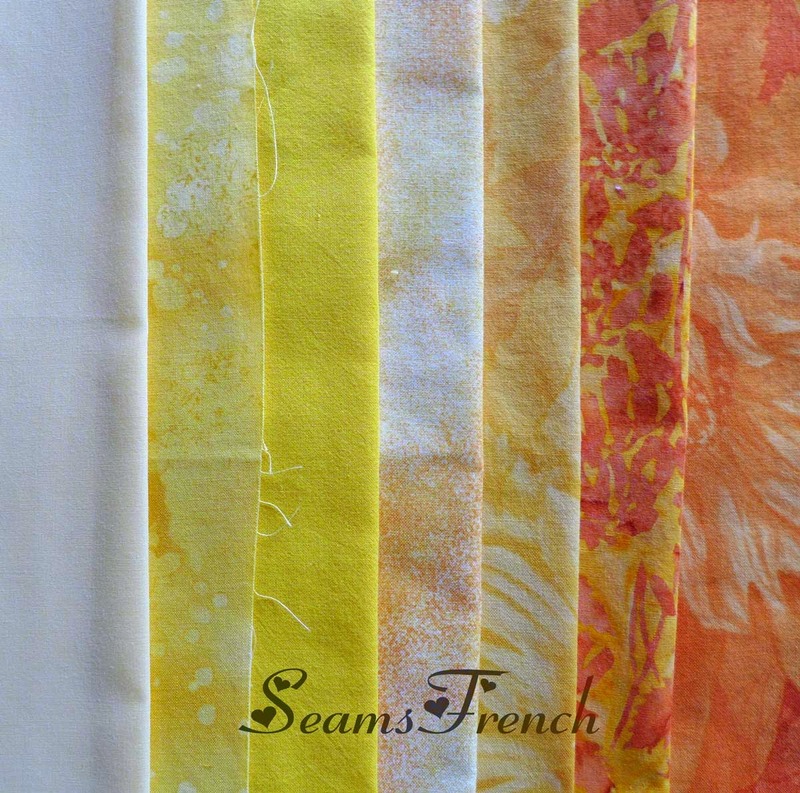 Pressed and trimmed and no where to go! 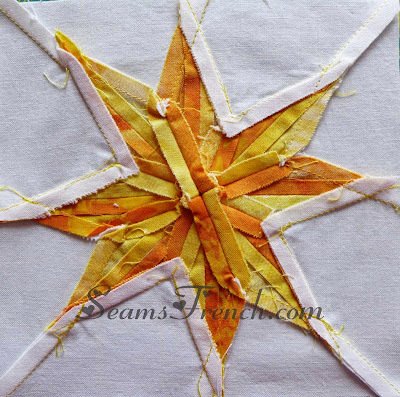 One of the numerous piecing methods that I attempted. So, after spending a week (or more) working my way through the construction of this galaxy, the verdict is that this first round of stars are just not right, Regardless of the construction frustrations, these stars just don't do it for me. They are too heavy. There's no sparkle. They don't twinkle! I pieced 9 stars using these various methods. 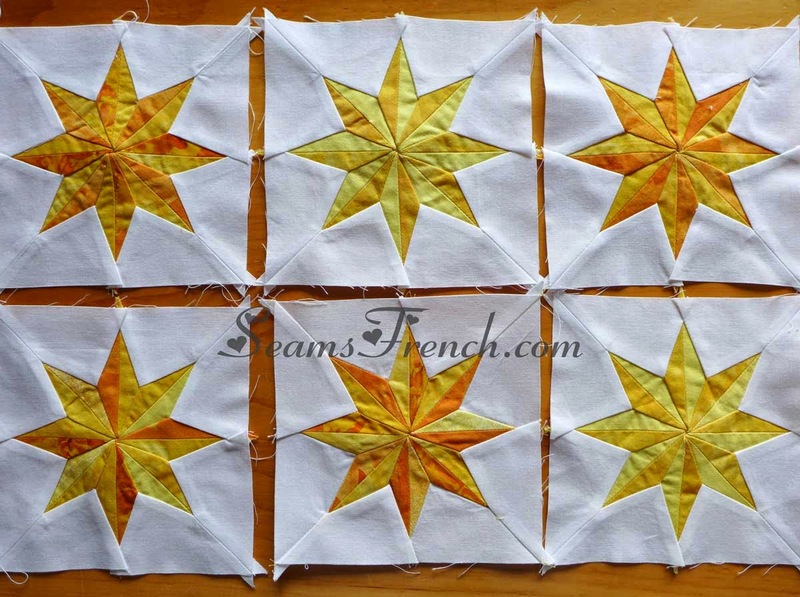 The Alex Anderson method, (bottom row, middle star), was the most successful, but it's not right for this quilt. So, it's "Yoiks and Away"! Time to check out other construction options. I must find those twinkling little stars! I admire your persistence! It's a pretty design, but I think it's just too many seams in the middle. Maybe you could redesign it, maybe with a diamond in the middle so all the seams don't come all the way in? It's a great idea, so good luck! Had I done a little more research on star construction before I embarked head first into the endeavor, I would have noticed that very often, when split point stars are used, it's seldom that the points all meet in the center. Usually there is a circle or diamond or even another simple star in the center. These particular stars have been relegated to a future remedial project, when I will alter the center so that these points don't all converge at the same place. A diamond or circle or a something will be part of the equation. However, that's for another day, another project. They are beautiful, even in their (slight) imperfection. What about a hexie in the middle, surrounded by jewels? Another option would be to enlarge your block. 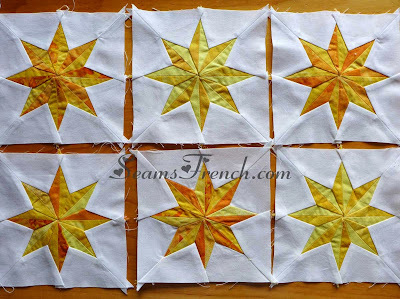 You'd have less bulk, but larger blocks just may not be feasible for a baby quilt. 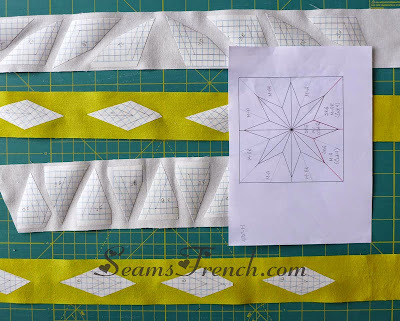 Have you tried foundation paper piecing? I have t done it myself, but have seen some incredible blocks made using that technique. Good luck and let us know how it goes!